Using Brazil's first national study on domestic tourism by travelers with disabilities this address looks at some preliminary points to making the PETAR region truly a destination for all. It was my privilege to be invited to present at a conference on disability, development, and citizenship in Brazil. The conference site, Eldourado in the interior of S?o Paulo state sits in the Upper Ribeira River Ecological Park (PETAR) which is a world patrimony site. The geology is formed by the collision of massive tectonic plates making the surface highly fractured. Called karst he area is riddled with caves. In fact, it contains South America's largest network of caves. 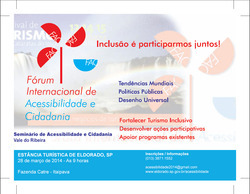 One objective of the conference is to develop accessibility for the caves as tourist destinations. Yet the region is also culturally unique. It is one o the poorest and least developed regions of Brazil. Its also home to maroons or quilimbos - communities historically formed by former slaves of African descent. This is a region that can truly benefit from the innovative approach to social and economic development that is Inclusive Tourism and Inclusive Development. This presentation also exists in Portuguese and Spanish translation. "In our country, there are no disabled people." This is a quote attributed to Soviet communist party leader Leonid Breschnev in the 1980s. But can the Paralympics help bring a marginalized group in Russia's population into the national spotlight? "Archaeologists are exposing the foundations of our unequal society while we are witnessing a perverse attempt to remake the city into something resembling Miami or Dubai," said Cláudio Lima Castro, an architect and scholar of urban planning. "We're losing an opportunity to focus in detail on our past, and maybe even learn from it." In the spirit of Olympic and Paralympic legacy, VisitEngland today launches a national marketing campaign aimed at championing and improving accessible tourism in England, a sector worth over ￡2billion a year* to the domestic tourism industry, with strong growth potential. The national tourist board has worked with a number of destinations and the Disabled Persons Railcard to develop exciting guides highlighting fantastic and accessible tourism experiences across the country. The Access for All Campaign aims to position England as a leading destination for accessible tourism. The campaign, funded by ￡100,000 from the Government's Regional Growth Fund (RGF) plus contributions from partners, is a cost-effective way for selected English destinations to showcase their accessible tourism businesses and attract more visits from disabled travellers and others with access needs, and their companions.
? Leicestershire - Situated in the heart of the country, Leicestershire has been welcoming visitors for more than 2,000 years - everyone from Roman armies to medieval Kings and Queens. Visitors to the city and county can explore its unique heritage in a new accessible package, Stay Play Explore Glorious Heritage. Visit the Bosworth Battlefield Heritage Centre, site of the dramatic conclusion to the Wars of the Roses, where Richard III lost his life and Henry Tudor was crowned king. From here, visit the Richard III exhibition at Leicester's Guildhall to continue your discovery of this intriguing monarch, before taking afternoon tea at The Belmont Hotel. The National Brewery Centre makes a perfect pit stop, and celebrates the history, art and fun of brewing. Finally, see the National Memorial Arboretum and Snibston Discovery Museum, the largest science and technology museum in the East Midlands. The Stay Play Explore Glorious Heritage package includes entry to a choice of three out of five attractions and an overnight stay at the 4-star Hinckley Island Hotel for just ￡109. Each site has completed VisitEngland's Access for All programme and offers excellent facilities and access.
? NewcastleGateshead - A must-see for visitors to NewcastleGateshead is the BALTIC Centre for Contemporary Art, with its four accessible gallery spaces, it has an ever-changing programme of exhibitions. NewcastleGateshead is home to Europe's largest shopping and leisure centre, intu Metrocentre which offers a range of services for visitors with accessibility needs, including Shopmobility, assisted changing facilities, and free wheelchair hire. The city is also home to one of the world's premier music venues, Sage Gateshead. This 'Access for All' award-winning venue's extensive access facilities include level access throughout, hearing loop systems, 35 accessible toilets and monitored light levels in all areas. At the end of a long day, head back to the Hilton Newcastle Gateshead, an award-winning hotel set on the historic Quayside with fantastic views over the River Tyne. There are twelve accessible guest rooms, including three Executive rooms which have access to a private lounge and panoramic views of the city.
? Brighton - Bustling seaside destination Brighton & Hove has a jam-packed cultural calendar, making it a top spot for a seaside break. Take in Brighton's art culture with visits to the Brighton Museum and Art Gallery and the Hove Museum & Art Gallery. Heritage fans can visit Brighton's spectacular seaside palace, the Royal Pavilion, with easy access throughout the ground floor, or visit the nearby Preston Manor, a delightful Edwardian country house with the ground floor, basement and walled garden accessible for all visitors. Thistle Brighton, Jurys Inn and Hilton Brighton Metropole have all been through VisitEngland's Access for All programme and feature guest rooms accessible for wheelchair users and visually or hearing impaired guests. VisitBrighton offers downloadable factsheets about access in the city and a map showing step free access to the main hotels and attractions, and the locations of dropped kerbs around the city.
? Bath - For centuries, Bath has enchanted everyone from ancient Romans to Jane Austen and it continues to offer everything required for a perfect weekend break: from heritage sites and contemporary culture to top hotels and excellent food. You can take in the atmosphere and impressive architecture on a fully personalised tour with Bath Parade Guides. Renovations to The Roman Baths - one of the wonders of Roman England - have made the Baths accessible for all, and include a lift to the lower level museum, level access, and ramps across ancient Roman obstacles. The Bath for Everyone offer for ￡74.50 will transport you to the city's origins and ensure you get to know the best of Bath. Take in Bath's culture and visit the Fashion Museum, housed in the impressive 18th century Assembly Rooms. All floors are accessible and equipped with ramps, a lift and level access throughout. Victoria Art Gallery is home to a plethora of international artists from the 15th century to the present day. Make a weekend of it with a stay at the Holiday Inn Express, where seven purpose-built accessible guest rooms have been designed to suit a variety of access needs. James Berresford, chief executive of VisitEngland said: "England is a very accessible destination with plenty on offer for everyone. This is a wonderful opportunity to showcase these particular locations as shining examples of best practice; to build on the legacy of the 2012 Paralympic Games and encourage tourism businesses to make the most of the accessible tourism market, which has enormous potential for growth. Whether exploring the wonders of Roman England in Bath, enjoying a vibrant seaside break in Brighton, journeying through Leicestershire's heritage, or taking in the bustle of NewcastleGateshead, with these guides you can enjoy a fantastic holiday and feel confident that the places you visit are working hard to meet your access needs." Download the guides from the 4th March in either PDF, large print Word or audio format from VisitEngland.com/accessforall. A limited number of printed copies are available for those who cannot access the guides online. Email Trang web cá cược trực tuyếnqad@VisitEngland.org or call 0207 578 1454. Candace Cable in Armenia spreading the word about living with disabilities.